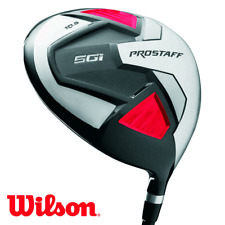 The new Wilson Pro staff SGI driver, successor of the very successful Wilson Pro staff HDX drivers. Matching Headcover. Quality low-torque Ultra-Light Graphite shaft Regular flex shaft. High quality Driver. Single men’s Driver/No1 Wood golf club. Make - WILSON. Model - DEEP RED / HIGH LAUNCH. Shaft - REGULAR FLEX GRAPHITE SHAFT. Grip - WILSON BLACK GRIP. Golf club is Brand New with the club head still wrapped. SHAFT:UST MAMIYA. LENGTH: STANDARD. GRIP SIZE:STANDARD. GRIP:7/ 10. HEADCOVER:NOT INCLUDED. 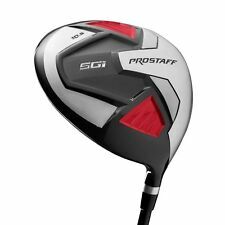 New listingWilson Profile 10.5 Degree Driver Fairway & Hybrid Mens Right Hand Reg Flex. Head cover: Yes Driver & Fairway Only. Flex: Regular. Clubs have been played with and cared for in an appropriate fashion. The markings that you will likely find on products will show typical wear of models of its age. WILSON FAT SHAFT. (Shaft Has Bag Rub marks on & Bag clatter,Marks on Sole). 1 WOOD DRIVER. SHAFT 5/10 (R Flex). USED CLUB WITH MARKS/WARE. RIGHT HANDED. GRIP 5 /10 (NIBBLED AT BASE). USED CONDITION. SHAFT GOOD. THIS IS A DECENT DRIVER. REGULAR FLEX ALDILA ROGUE 60 GRAPHITE SHAFT. WILSON TRITON DVD DRIVER. 10.5 DEGREE. SHAFT- 8/10. HEAD- 8 /10. GRIP- 8 /10. SHAFT:DIAMANA 60 S . MODEL:FG TOUR 5. HEADCOVER:NOT INCLUDED. The sale includes a head cover. The club is in excellent condition and has barely a mark, it is almost like new. I note only slight scuff mark on the inside face of the head (can be seen in the photo). 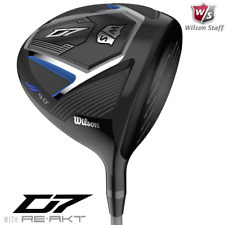 WILSON STAFF D7 DRIVER 10.5 DEGREE REGULAR SHAFT. Condition is New. Dispatched with eBay delivery – Shutl 1 day. Shaved, to increase COR to 0.9. This driver was sent away to get the face. WILSON DEEP REF FATSHAFT BETA TITANIUM DRIVER IN EXCELLENT USED CONDITION AS YOU CAN CLEARLY SEE FROM THE PICTURES. WILSON FATSHAFT GRAFALLOY REGULAR FLEX GRAPHITE SHAFT IN EXCELLENT CONDITION. WILSON GOLF PRIDE GRIP IN VERY GOOD CONDITION. New for 2019, the Wilson Staff D7 driver has been engineered with advanced. The D7 driver has weighting positioned where you need it the most, the higher lofted driver. All goods remain the property of HOTGOLF LTD until paid for in full. TOUR STIFF FLEX ALDILA ROGUE 125 MSI GRAPHITE SHAFT. WILSON TRITON DVD DRIVER. 10.5 DEGREE. SHAFT- 8/10. HEAD- 7.5 /10. GRIP- 8 /10. Wilson ProStaff HL. 10.5 Degree Driver. REGULAR FLEX MATRIX SPEED RUL-Z 44 GRAPHITE SHAFT. WILSON D-300 DRIVER. 10.5 DEGREE. SHAFT- 7.5/10. GOLF PRIDE TOUR 25 LIGHTWEIGHT GRIP. GRIP- 7.5/ 10. Wilson Deep Red II Driver. Graphite Regular Flex. 10.5 Degree. (All photos are of the actual club being sold). Head Condition: 5/10 - Well Used Condition. Face Condition: 6/10 - Fair Condition. Condition Details. The head is in Good Condition with just a few used marks on it. The shaft is a Wilson Deep Red Graphite Shaft with Regular Flex and it is in Good Condition with just the usual used marks on it. The grip is a a Wilson Grip and it is in Very Good Condition with plenty of life left in it. REGULAR FLEX FUJIKURA FIT-ON GRAPHITE SHAFT. WILSON STAFF SMOOTH DRIVER. GOLF PRIDE TOUR VELVET GRIP. 10.5 DEGREE. SHAFT – 5/10. GRIP – 6/ 10. X-FLEX MATRIX SPEED RULZ 65 GRAPHITE SHAFT. WILSON D300 DEMO DRIVER. ORIGINAL WILSON GRIP. SHAFT- 7.5/10. HEAD- 7.5 /10. GRIP- 7.5 /10. MODEL:DEEP RED Ti FORGED 400cc. GRIP:WILSON GOLF PRIDE SOFTIE. GRIP SIZE:STANDARD. HEADCOVER:NOT INCLUDED. SENIOR FLEX MATRIX SPEED RULZ 44 GRAPHITE SHAFT. WILSON D300 DEMO DRIVER. ORIGINAL WILSON GRIP. SHAFT- 7.5/10. HEAD- 7.5 /10. GRIP- 7.5 /10. Wilson Deep Red II Maxx. 10.5 Degree Driver. Refinished Wilson Killer Whale. 10.5 Degree Driver. Lincs Golf. Premium Fujikura Atmos Shaft. Adjustable Loft Driver. The heart of the Wilson Staff Cortex Driver is Fast Cage Technology. Over 44% of the. weight can easily be moved to the heel and the 2g to be inserted near the toe. STIFF FLEX MATRIX SPEED RUL-Z A-TYPE 44 GRAPHITE SHAFT. 10.5 DEGREE. SHAFT- 8.5/10. N C-300 DRIVER. GRIP- 8.5/10. MATCHING HEADCOVER INCLUDED - 8.5/10 - NO WRENCH. HEAD- 10/10. REGULAR FLEX MATRIX SPEED RULZ 44 GRAPHITE SHAFT. WILSON D300 DEMO DRIVER. ORIGINAL WILSON GRIP. SHAFT- 7.5/10. HEAD- 7.5 /10. GRIP- 7.5 /10. WILSON Dd6 DRIVER. STIFF FLEX ALDILA NVS-DL 65 GRAPHITE SHAFT. WILSON GOLF PRIDE GRIP. 8.5 DEGREE. SHAFT- 7.5/10. FOR SALE IN OK USED CONDITION, A WILSON 1200 CGI RIGHT HANDED 10.5 DEGREE DRIVER. Wilson 1200 System 45. 11 Degree Driver. Lincs Golf. STIFF FLEX FUJIKURA SPEEDER PRO 58 GRAPHITE SHAFT. WILSON C-300 DRIVER. LAMKIN WILSON STAFF GRIP. SHAFT- 8/10. HEAD- 8 /10. GRIP- 8 /10. FUJIKURA SPEEDER PRO 58 REGULAR SHAFT. WILSON C300 DRIVER / 10.5 DEGREE. The Wilson Staff C300 revolutionary new driver is the first and only driver to feature Power Holes on the crown and sole near the face, expanding the sweet spot and flexing more at impact for greater ball speeds across the entire hitting surface and explosive distance. Wilson Prostaff Driver10.5 degrees Loft. Wilson fatshaft 3 driver/ Fairway The club has usual use Marks and slight bag rub on the shaft but is in good used condition Please see photos for full head and shaft spec: Collection welcome Stafford ST16 cash on collection please . Please view my other golf items and thanks for looking.